Warner Bros. brings action fans the blood-soaked thriller “Ninja Assassin,” directed by James McTeigue (“V for Vendetta”) and produced by Joel Silver, Larry Wachowski and Andy Wachowski (“The Matrix” trilogy). “Ninja Assassin” stars Korean pop star Rain (“Speed Racer”) as the central character, Raizo; Naomie Harris (“Pirates of the Caribbean: At World’s End”) as Europol researcher Mika Coretti; Ben Miles (“V for Vendetta”) as Europol Agent Ryan Maslow; legendary martial arts performer Sho Kosugi (“Revenge of the Ninja”) as the ruthless leader of the Ozunu Clan; and Rick Yune (“Die Another Day“) as Raizo’s rival, Takeshi. 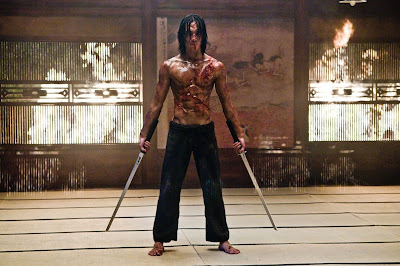 “Ninja Assassin” follows Raizo, one of the deadliest assassins in the world. Taken from the streets as a child, he was transformed into a trained killer by the Ozunu Clan, a secret society whose very existence is considered a myth. But haunted by the merciless execution of his friend by the Clan, Raizo breaks free from them…and vanishes. Now he waits, preparing to exact his revenge. In Berlin, Europol agent Mika Coretti has stumbled upon a money trail linking several political murders to an underground network of untraceable assassins from the Far East. Defying the orders of her superior, Ryan Maslow, Mika digs into top secret agency files to learn the truth behind the murders. Her investigation makes her a target, and the Ozunu Clan sends a team of killers, led by the lethal Takeshi, to silence her forever. Raizo saves Mika from her attackers, but he knows that the Clan will not rest until they are both eliminated. Now, entangled in a deadly game of cat and mouse through the streets of Europe, Raizo and Mika must trust one another if they hope to survive…and finally bring down the elusive Ozunu Clan. The behind-the-scenes creative team includes director of photography Karl Walter Lindenlaub, production designer Graham “Grace” Walker, costume designer Carlo Poggioli and editor Gian Ganziano. The Wachowski brothers’ longtime stunt coordinators Chad Stahelski and David Leitch are also on board as second unit co-directors. Opening soon across the Philippines, “Ninja Assassin” is a Warner Bros. Pictures presentation in association with Legendary Pictures and Dark Castle Entertainment.